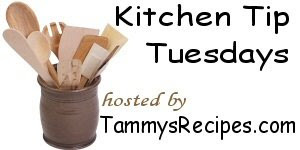 Homemaker Highlights: Kitchen tip Tuesdays. Now I know you are looking at this and shaking your head NO WAY! Trust me on this these three things were meant for each other. First drain the tuna and then just dump in with the eggs. Scramble all together. Once fully cooked throw some pickles on the side and eat together. It sounds like non-sense. But, even the most picky eaters.....I have gotten to eat this and actually had great things to say about it. So my tip for today is to try some weird recipes that you would not ordinarily cook. You maybe surprised at what new thing may become your new favorite. Well you are right - never thought to combine tuna and eggs. BUT - I have been racking my brain for ways to get my kids to eat more eggs. They are 4,3 and 1 and are NOT picky eaters, but none of them like eggs. They are such a cheap source of great nutrition that I am determined to change their little minds :). Perhaps this is the trick - Thanks!